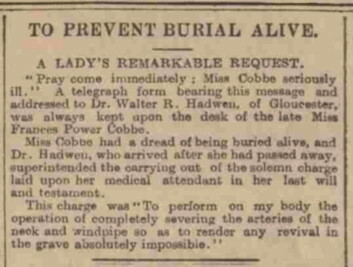 "Pray come immediately: Miss Cobbe seriously ill." A telegraph form bearing this message and addressed to Dr. Walter R. Hadwen, of Gloucester, was always kept upon the desk of the late Miss Frances Power Cobbe. Miss Cobbe had a dread of being buried alive, and Dr. Hadwen, who arrived after she had passed away, superintended the carrying out of the solemn charge laid upon her medical attendant in her last will and testament. This charge was "To perform on my body the operation of completely severing the arteries of the neck and windpipe so as to render any revival in the grave absolutely impossible." Here's the wikipedia entry about the woman in question, though it doesn't mention her postmortem request. Don't worry, Patty. You wouldn't wake up. These days they do make sure you're good and dead before they cremate you. Or bury you, for that matter. Note that reports of this frequently happening in earlier times are massively exaggerated. Once or twice, maybe. Dozens each year? Nah. A good story for vampire myths, nothing else. As for reports of someone being buries alive and panicking for hours or even days before being rescued... not a chance. You suffocate after 45 minutes at most, and probably won't be conscious at any point. The Mythbusters tested this, and even Jamie didn't last long before they had to haul him out - and he went in fully alert in the first place. She had ring-a-dingrephoba and couldn't use a bell on a string like everyone else? I can understand her concern! Don't ask me to explain it, but every time I wake up flat on my back, I panic. Nurses think I'm being a special kind of pita because I make them promise to put me on my side in the recovery room after surgery, but I saved the EKG strip from when I was on a heart monitor, and they laid me flat -- I pegged out the machine! Maybe I should put it in my will that I want to be buried in the fetal position. In the 1890s, someone did a study about disinterments. 4% had obviously been buried alive, and another 24% 'showed signs' they might have been. 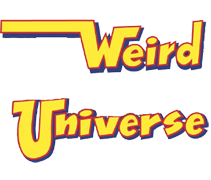 (I bookmarked the article more than 10 years ago because I might want to cite it someday, so naturally when the opportunity to use it finally comes along, the whole site is gone!) I remember those stats clearly because the guy had to wait nearly a decade for there to be 25 disinterments (which he considered the minimum so he'd wind up with nice, round percentages). Isn't buried alive akin to being so stupid us guys marry and have kids ? Cobbe died April 5, 1904; the date of the article in the "Western Gazette" is over a year later: April 15, 1905 -- over a year later. Is there any chance that the date of the newspaper article is incorrect and actually 1904?